You can enjoy paddleboarding on cheap Hawaii family vacations. While traveling to Hawaii can be expensive, there are many ways to bring the cost down. Traveling as a family has its perks. There are often package deals for boat tours, meals and lessons offering both senior citizen and student discounts. Here are our favorite family-friendly activities to help you plan cheap family vacations in Hawaii. 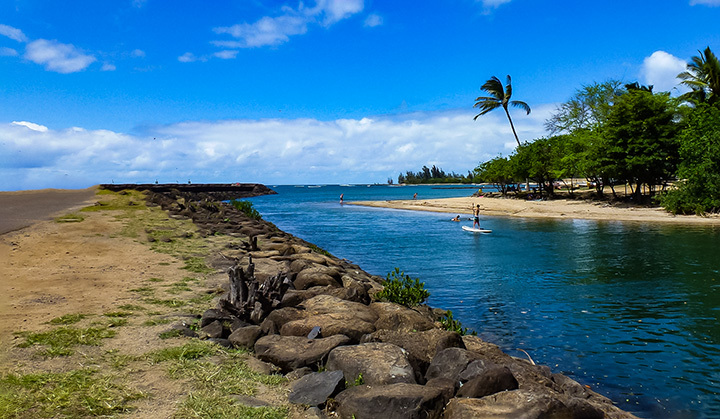 Before you head to Hawaii, discuss any budgetary limitations for the trip with your family. For example, maybe each person will get to choose one activity that the parents will pay for. Maybe money is tight and just getting to Hawaii is a serious feat. 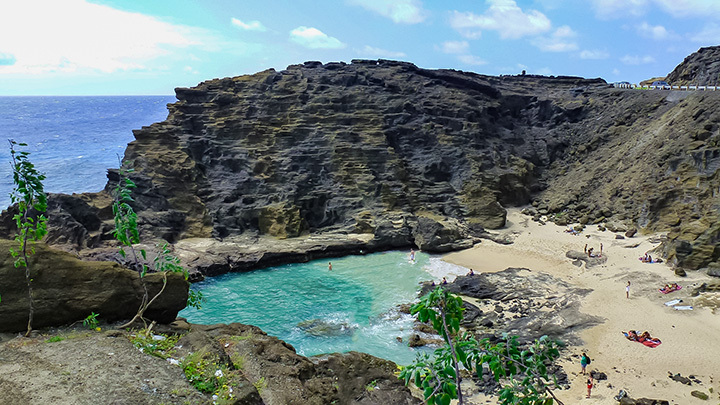 The good news is there are many free things to do on Oahu as well as on other islands. Perhaps this is the trip you always wanted, but you still do not want to over-spend by always eating out. Explain all your expectations to everyone going on the trip before departing. Knowing the plan will help everyone focus on what they can do, instead of what they can’t. Hotels and resorts often provide beautiful suites for families to share. But whether you stay at a resort or hotel, try to choose a place with a kitchen. Condos and and rental homes usually have couch-beds, mattresses or bunks. They allow more people to sleep comfortably without having to rent any extra rooms. Generally speaking, the larger the group, the better deal rental homes and condos become. Famous Halona Cove, site of the kissing scene in the film, From Here to Eternity. Planning daily itineraries can help in planning cheap family vacations in Hawaii. If there are openings in your schedule, consider writing a list of exciting can-do options. Hike in forested areas. Swim in coves full of reef fish. Visiting famous beaches. Plan a picnic for a sunset beach dinner. 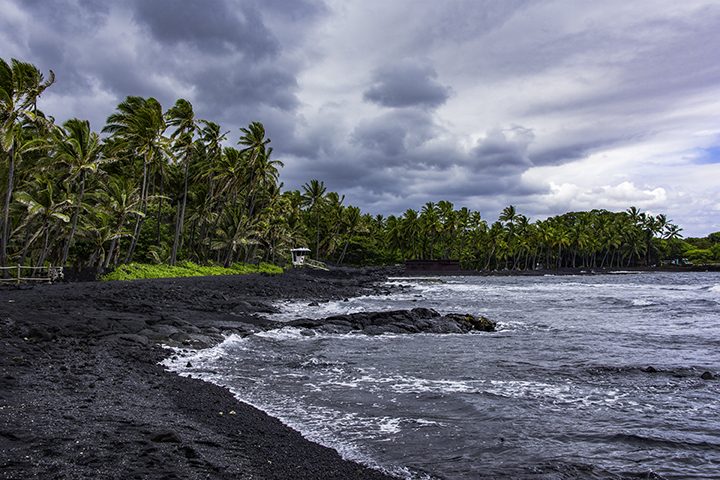 Or even explore lava rock formations or historical sites. Such outdoor activities can be fun and inexpensive to do. Other free things can include self-guided tours, entertainment, live music, shows, festivals and events. 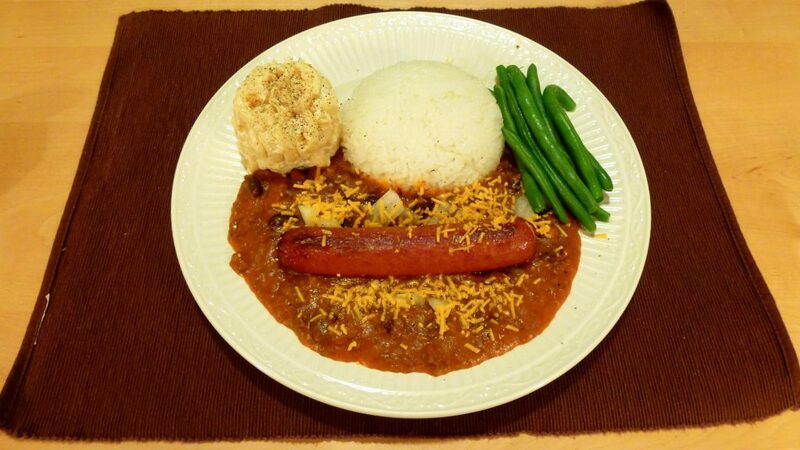 Chili franks plate, a classic local dish for your family to try. If you are worried about eating out, there are other options for visitors in Hawaii. While groceries in Hawaii can be more expensive than the mainland, they’re still less expensive than restaurants. One option is to go to the farmer’s market with your family. Here, there is an abundance of inexpensive foods and tropical fruits. If have a kitchen, you’ll be able plan and cook most of your own meals. You can make cooking a family event. Have everyone split up into teams that cook together on different nights during your vacation. Having a place to cook your own meals is a great way to enjoy cheap family vacations in Hawaii. To give it a genuine Hawaiian flare, have them incorporate local ingredients into your meals. But if you want to eat out, trying authentic Hawaiian foods, you should talk to locals to find the best deals. The Hawaiian Islands could be ideal place to be if the goal is to spend a limited amount of money. This is because Hawaii offers ample opportunities for free or low-cost entertainment, activities and relaxation. But if you are to going to spend, limit the days you splurge on activities like a luau, sunset cruise or surfing lessons. Then for the rest of the time, make your own meals, go on hikes, play on the beach or do other inexpensive activities. Activities tailor-made for cheap family vacations in Hawaii include: historical learning centers, surf spots for beginners, walking tours, art galleries, state parks, museums, aquariums, and colorful beaches. Additionally, many of Hawaii’s resorts organize daily events, crafts classes and playtime for children.